My name is Stephanie and I am chief editor of Shakara Natural Tips. Check it out! I am Nigerian but currently residing in Canada. I've been natural for a year now. 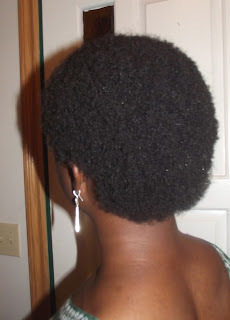 I went natural a few times in the past but did not understand how to take care of my hair. I didn't know there was a process to caring for it. About a year ago I got a phone call from my eldest sister, she gave me basic tips on how to care for my natural hair...that's how the journey really began. It's an amazing experience! Chemical relaxers, heat straightening and weaves were ruining my hair, especially my hair line. I can remember thinking "something's gotta give!" Last year September I made the decision to go natural completely. I must admit, like anything in life, it was challenging at first; but it's become easier with time. I have't been to Nigeria since I went natural. When I do, hopefully it'll be positive. However I still experience people giving me unsolicited advice. It's my hair not theirs and it's important to be sensitive to others before speaking. It's actually very simple. I co-wash every 7-14 days and shampoo/cleanse once a month. I protein deep condition every 4 weeks. I'm always on protective styles, twists, bantu knots, etc (which I wear for 3-4 weeks, so my ends are always safely tucked away). I've also learnt to balance protein and water based moisture treatments. I like to henna every 4-8 weeks, because it conditions, thickens and strengthens hair . Lastly, I LOVE DIY recipes so half of the products I use...I make! There are so many, this list doesn't even come close... CurlyNikki, CharyJay, Tony Daley, Ysheena So Curly, The Hodgepodge Files, Frostoppa, Naturally Free to be Me, etc! What inspired me to start Shakara Natural Tips? More like who....My sister (Tokie). I've always loved to write, I've also won recognition from various institutions for writing...plus I'm really into fashion, beauty, hair and make-up. After a 5 year writing hiatus my sister made certain I began writing again (of course about the things I'm passionate about). I owe her a lot, she's the brain behind SNT. Thanks a lot for talking to us, Stephanie, and shout-out to your sister! 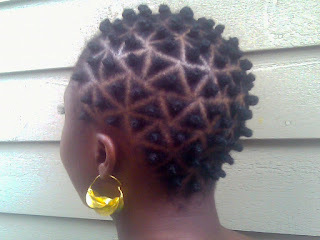 PS: You're going to have to teach me to part my hair as neatly as you do with your bantu knots! I follow Stephanie's blog and it is awesome!! Those Bantu Knots are the business! You're welcome, and they are, aren't they! Make sure you let us know when your new blog is up and running! Pleasure is ALL mine, Stephanie! Those bantu knots tho. The Business! I always think it's interesting how people seem to only do bantu knots for the bantu knot out, when the bantu knots themselves can also be worn beautifully on their own.